Have you ever put together an outfit either for yourself or a child and thought, “If only we had a bow to match”? Well, we’ve solved that problem for you with this free easy crochet bow pattern. Now you can customize to your heart’s content and never be without an accessory. These adorable bows can be used as hair clips, but also for accessorizing a favorite bag, sweater, scarf, or hat. They’d be cute as napkin rings, in a garland, on a wreath, or as gift tags as well. These are so easy to make, in fact, that you might as well grab the remains of all the skeins in your stash and whip up a few dozen while you’re at it. There are also a variety of ways to stitch these. 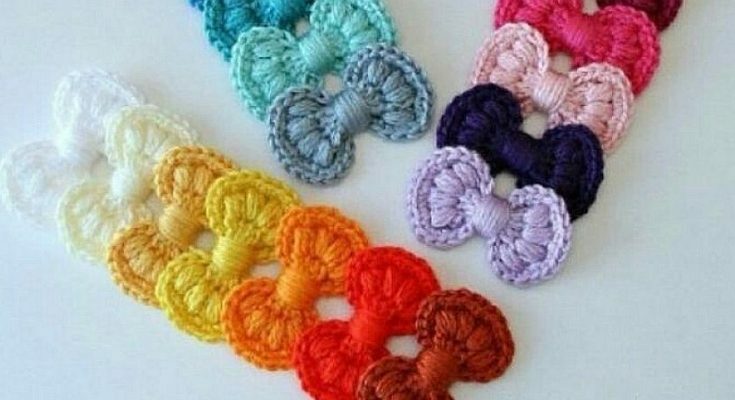 According to the look of the bows below, it appears that back loop only (blo) is used along with either a half double crochet (hdc) or single crochet (sc) stitch. You could also use a bubble stitch or a picot stitch, depending on how fancy you want to get. Want to make your own fashion accessories? You can find video tutorials either here or here.